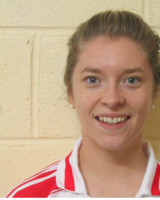 Jennifer Downey, Jnr Club Captain 2015. Favourite Sporting Moment: Reaching this years county final with my club. Most embarrassing moment on or off the football field: Taking a penalty in a camogie game and completely missing the sliotar!!! One rule you would change in our game: Get rid of the sin-bin!! !